Sigismund of Luxembourg (15 February 1368 in Nuremberg – 9 December 1437 in Znaim, Moravia) was Prince-elector of Brandenburg from 1378 until 1388 and from 1411 until 1415, King of Hungary and Croatia from 1387, King of Germany from 1411, King of Bohemia from 1419, King of Italy from 1431, and Holy Roman Emperor from 1433 until 1437, and the last male member of the House of Luxembourg. In 1396 he led the Crusade of Nicopolis, which attempted to liberate Bulgaria and save the Byzantine Empire and Constantinople from Ottoman rule. Afterwards, he founded the Order of the Dragon to fight the Turks. He was regarded as highly educated, spoke several languages (among them French, German, Hungarian, Italian, and Latin) and was an outgoing person who also took pleasure in the tournament. Sigismund was one of the driving forces behind the Council of Constance that ended the Papal Schism, but which also led to the Hussite Wars that dominated the later period of Sigismund's life. Born in Nuremberg, Sigismund was the son of the Holy Roman Emperor, Charles IV, and of his fourth wife, Elizabeth of Pomerania, who was the granddaughter of King Casimir III of Poland and the great-granddaughter of the Grand Duke of Lithuania, Gediminas. He was named after Saint Sigismund of Burgundy, the favourite saint of Sigismund's father. From Sigismund's childhood he was nicknamed the "ginger fox" (liška ryšavá) in the Crown of Bohemia, on account of his hair colour. Sigismund's first wife, Mary I, Queen of Hungary. King Louis the Great of Hungary and Poland always had a good and close relationship with Emperor Charles IV, and Sigismund was betrothed to Louis' eldest daughter, Mary, in 1374, when he was six years old. Upon his father's death in 1378, young Sigismund became Margrave of Brandenburg and was sent to the Hungarian court, where he soon learnt the Hungarian language and way of life, and became entirely devoted to his adopted country. King Louis named him as his heir and appointed him his successor as King of Hungary. In 1381, the then 13-year-old Sigismund was sent to Kraków by his eldest half-brother and guardian Wenceslaus, King of Germany and Bohemia, to learn Polish and to become acquainted with the land and its people. King Wenceslaus also gave him Neumark to facilitate communication between Brandenburg and Poland. The disagreement between Polish landlords of Lesser Poland on one side and landlords of Greater Poland on the other, regarding the choice of the future King of Poland, finally ended in choosing the Lithuanian side. The support of the lords of Greater Poland was however not enough to give Prince Sigismund the Polish crown. Instead, the landlords of Lesser Poland gave it to Mary's younger sister Jadwiga I of Poland, who married Jogaila of Lithuania. Gold coin of Sigismund of Hungary with his coat of arms (right), and the image of the King Saint Ladislaus I of Hungary (left). On the death of her father in 1382, his betrothed, Mary, became queen of Hungary and Sigismund married her in 1385 in Zólyom (today Zvolen). The next year, he was accepted as Mary's future co-ruler by the Treaty of Győr. 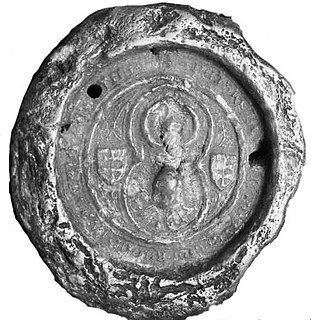 However, Mary was captured, together with her mother, Elizabeth of Bosnia, who had acted as regent, in 1387 by the rebellious House of Horvat, Bishop Paul Horvat of Mačva, his brother John Horvat and younger brother Ladislav. Sigismund's mother-in-law was strangled, while Mary was liberated. Having secured the support of the nobility, Sigismund was crowned King of Hungary at Székesfehérvár on 31 March 1387. Having raised money by pledging Brandenburg to his cousin Jobst, margrave of Moravia (1388), he was engaged for the next nine years in a ceaseless struggle for the possession of this unstable throne. The central power was finally weakened to such an extent that only Sigismund's alliance with the powerful Czillei-Garai League could ensure his position on the throne. It was not for entirely selfless reasons that one of the leagues of barons helped him to power: Sigismund had to pay for the support of the lords by transferring a sizeable part of the royal properties. (For some years, the baron's council governed the country in the name of the Holy Crown). The restoration of the authority of the central administration took decades of work. The bulk of the nation headed by the House of Garai was with him; but in the southern provinces between the Sava and the Drava, the Horvathys with the support of King Tvrtko I of Bosnia, Mary's maternal uncle, proclaimed as their king Ladislaus, king of Naples, son of the murdered Charles II of Hungary. Not until 1395 did Nicholas II Garay succeed in suppressing them. Mary died heavily pregnant in 1395. To ease the pressure from Hungarian nobles, Sigismund tried to employ foreign advisors, which was not popular, and he had to promise not to give land and nominations to other than Hungarian nobles. However, this was not applied to Stibor of Stiboricz, who was Sigismund's closest friend and advisor. On a number of occasions, Sigismund was imprisoned by nobles, but with help of the armies of Garai and Stibor of Stiboricz, he would regain power. King Sigismund of Hungary during the battle of Nicopolis in 1396. Painting by Ferenc Lohr (1896), main hall of the Castle of Vaja. In 1396, Sigismund led the combined armies of Christendom against the Turks, who had taken advantage of the temporary helplessness of Hungary to extend their dominion to the banks of the Danube. This crusade, preached by Pope Boniface IX, was very popular in Hungary. The nobles flocked in their thousands to the royal standard, and were reinforced by volunteers from nearly every part of Europe. The most important contingent being that of the French led by John the Fearless, son of Philip II, Duke of Burgundy. Sigismund set out with 90,000 men and a flotilla of 70 galleys. After capturing Vidin, he camped with his Hungarian armies before the fortress of Nicopolis. Sultan Bayezid I raised the siege of Constantinople and, at the head of 140,000 men, completely defeated the Christian forces in the Battle of Nicopolis fought between the 25 and 28 September 1396. Sigismund returned by sea and through the realm of Zeta, where he ordained a local Montenegrin lord Đurađ II with the islands of Hvar and Korčula for resistance against the Turks; the islands were returned to Sigismund after Đurađ's death in April 1403. The disaster at Nicopolis angered several Hungarian lords, leading to instability in the kingdom. Deprived of his authority in Hungary, Sigismund then turned his attention to securing the succession in Germany and Bohemia, and was recognized by his childless half-brother Wenceslaus IV as Vicar-General of the whole Empire. However, he was unable to support Wenceslaus when he was deposed in 1400, and Rupert of Germany, Elector Palatine, was elected German king in his stead. Sigismund of Luxembourg, official imprint. On his return to Hungary in 1401, Sigismund was imprisoned once and deposed twice. In 1401, Sigismund helped an uprising against Wenceslaus, during the course of which the Bohemian king was taken prisoner, and Sigismund ruled Bohemia for nineteen months. He released Wenceslaus in 1403. In the meantime, a group of Hungarian noblemen swore loyalty to the last Anjou monarch, Ladislaus of Naples, putting their hands on the relic of Saint Ladislas of Hungary in Nagyvárad. Ladislaus was the son of the murdered Charles II of Hungary, and thus a distant relative of the long dead King Louis I of Hungary. Ladislaus captured Zadar in 1403, but soon stopped any military advance. This struggle in turn led to a war with the Republic of Venice, as Ladislaus had sold the Dalmatian cities to the Venetians for 100,000 ducats before leaving for his own land. In the following years Sigismund acted indirectly to thwart Ladislaus' attempts to conquer central Italy, by allying with the Italian cities resisting him and by applying diplomatic pressure on him. Due to his frequent absences attending to business in the other countries over which he ruled, he was obliged to consult Diets in Hungary with more frequency than his predecessors and institute the office of Palatine as chief administrator while he was away. In 1404, Sigismund introduced the Placetum Regium. According to this decree, Papal bulls could not be pronounced in Hungary without the consent of the king. During his long reign, the royal castle of Buda became probably the largest Gothic palace of the late Middle Ages. Drinking horn of Sigismund of Luxembourg, before 1408. In about 1406, Sigismund married Mary's cousin Barbara of Celje (Barbara Celjska, nicknamed the "Messalina of Germany"), daughter of Count Hermann II of Celje. Hermann's mother Katarina Kotromanić (of the House of Kotromanic) and Mary's mother Queen Elizabeta (Elisabeth of Bosnia) were sisters, or cousins who were adoptive sisters. Tvrtko I was their first cousin and adopted brother, and perhaps even became heir apparent to Queen Mary. Tvrtko may have been murdered in 1391 on Sigismund's order. Sigismund managed to establish control in Slavonia. He did not hesitate to use violent methods (see Bloody Sabor of Križevci), but from the river Sava to the south his control was weak. Sigismund personally led an army of almost 50,000 "crusaders" against the Bosnians, culminating with the Battle of Dobor in 1408, a massacre of about 200 noble families. Threatened by Ottoman expansion, king Sigismund managed to strengthen the security of southern Hungarian borders by entering into a defensive alliance with despot Stefan Lazarević of Serbia. In 1403, Hungarian possessions in northwestern regions of Serbia (city of Belgrade and the Banate of Macsó), were given to despot Stefan, who pledged his allegiance to king Sigismund, remaining kings loyal vassal until death in 1427. Stefan's successor George Branković of Serbia also pledged his allegiance to Sigismund, returning Belgrade to the king. By maintaining close relations with Serbian rulers, Sigismund succeeded in securing southern borders of his realm. Sigismund founded his personal order of knights, the Order of the Dragon, after the victory at Dobor. The main goal of the order was fighting the Ottoman Empire. Members of the order were mostly his political allies and supporters. The main members of the order were Sigismund's close allies Nicholas II Garay, Hermann II of Celje, Stibor of Stiboricz, and Pippo Spano. The most important European monarchs became members of the order. He encouraged international trade by abolishing internal duties, regulating tariffs on foreign goods and standardizing weights and measures throughout the country. After the death of King Rupert of Germany in 1410, Sigismund – ignoring the claims of his half-brother Wenceslaus – was elected as successor by three of the electors on 10 September 1410, but he was opposed by his cousin Jobst of Moravia, who had been elected by four electors in a different election on 1 October. Jobst's death 18 January 1411 removed this conflict and Sigismund was again elected king on 21 July 1411. His coronation was deferred until 8 November 1414, when it took place at Aachen. On a number of occasions, and in 1410 in particular, Sigismund allied himself with the Teutonic Knights against Władysław II of Poland. In return for 300.000 ducats he would attack Poland from the south after the truce on St. John's Day, 24 June expired. Sigismund ordered his most loyal friend Stibor of Stiboricz to set up the attack on Poland. Stibor of Stiboricz was of Polish origin and from the main line of the powerful Clan of Ostoja that had also been against choosing Jagiello as King of Poland. With the support of Sigismund, Stibor become one of the most influential men in late medieval Europe, holding titles as Duke of Transylvania and owning about 25% of modern-day Slovakia, including 31 castles of which 15 were situated around the 406 km long Váh river with surrounding land that was given to him by Sigismund. In the diplomatic struggle to prevent war between Poland-Lithuania, which was supported by the Muscovites, and the Teutonic Knights, Sigismund used Stibor's fine diplomacy to gain financially. The Polish side appointed several negotiators and most of them were also from the Clan of Ostoja, distant relations of the Stibors. However, those "family meetings" could not prevent the war and an alliance of twenty-two western states formed an army against Poland in the Battle of Grunwald in July 1410. Stibor attacked then Nowy Sącz and burned it to the ground, but after that he returned with his army back to the Beckov Castle. After the Polish-Lithuanian victory in the Battle of Grunwald, the Teutonic knights had to pay a huge sum of silver to Poland as reparation and again, through diplomacy of his friend Stibor, Sigismund was able to borrow all this silver from King Władysław II of Poland on good conditions. In the light of facts about the diplomatic work of Stibor and the Clan of Ostoja that was following the politics of King Sigismund, one can question whether Sigismund actually joined the anti-Polish alliance. Sigismund and Barbara of Celje at the Council of Constance. From 1412 to 1423, Sigismund campaigned against the Venetians in Italy. The king took advantage of the difficulties of Antipope John XXIII to obtain a promise that a council should be called in Constance in 1414 to settle the Western Schism. He took a leading part in the deliberations of this assembly, and during the sittings made a journey to France, England and Burgundy in a vain attempt to secure the abdication of the three rival popes. 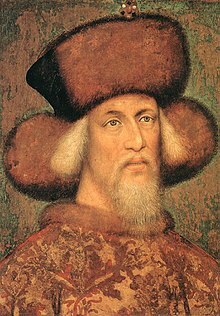 The council ended in 1418, solving the Schism and — of great consequence to Sigismund's future career — having the Czech religious reformer, Jan Hus, burned at the stake for heresy in July 1415. The complicity of Sigismund in the death of Hus is a matter of controversy. He had granted him a safe-conduct and protested against his imprisonment; and the reformer was burned during his absence. I am king of the Romans and above grammar. This utterance prompted historian Thomas Carlyle to give him the nickname "Super Grammaticam" from the response that he had given ("Ego sum rex Romanus et super grammaticam"). An alliance with England against France, and a failed attempt, owing to the hostility of the princes, to secure peace in Germany by a league of the towns, were his main acts during these years. Also, Sigismund granted control of the Margraviate of Brandenburg (which he had received back after Jobst's death) to Frederick I of Hohenzollern, burgrave of Nuremberg (1415). This step made the Hohenzollern family one of the most important in Germany. Sigismund began to shift his alliance from France to England after the French defeat at the Battle of Agincourt. The Treaty of Canterbury (August 15, 1416) culminated diplomatic efforts between Henry V of England and Sigismund and resulted in a defensive and offensive alliance against France. This, in turn, led the way to the resolution of the papal schism. Portrait of Emperor Sigismund, painted by Albrecht Dürer after the emperor's death. In 1419, the death of Wenceslaus IV left Sigismund titular King of Bohemia, but he had to wait for seventeen years before the Czech Estates would acknowledge him. Although the two dignities of King of the Romans and King of Bohemia added considerably to his importance, and indeed made him the nominal temporal head of Christendom, they conferred no increase of power and financially embarrassed him. It was only as King of Hungary that he had succeeded in establishing his authority and in doing anything for the order and good government of the land. Entrusting the government of Bohemia to Sofia of Bavaria, the widow of Wenceslaus, he hastened into Hungary. The Bohemians, who distrusted him as the betrayer of Hus, were soon in arms; and the flame was fanned when Sigismund declared his intention of prosecuting the war against heretics. Three campaigns against the Hussites ended in disaster although the army of his most loyal ally Stibor of Stiboricz and later his son Stibor of Beckov could hold the Hussite side away from the borders of the Kingdom. The Turks were again attacking Hungary. The king, unable to obtain support from the German princes, was powerless in Bohemia. His attempts at the diet of Nuremberg in 1422 to raise a mercenary army were foiled by the resistance of the towns; and in 1424 the electors, among whom was Sigismund's former ally, Frederick I of Hohenzollern, sought to strengthen their own authority at the expense of the king. Although the scheme failed, the danger to Germany from the Hussites led to the Union of Bingen, which virtually deprived Sigismund of the leadership of the war and the headship of Germany. In 1428, Sigismund led another campaign against the Turks, but again with few results. In 1431, he went to Milan where on 25 November he received the Iron Crown as King of Italy; after which he remained for some time at Siena, negotiating for his coronation as emperor and for the recognition of the Council of Basel by Pope Eugenius IV. He was crowned emperor in Rome on 31 May 1433, and after obtaining his demands from the Pope returned to Bohemia, where he was recognized as king in 1436, though his power was little more than nominal. Shortly after he was crowned, Pope Eugenius began attempts to create a new anti-Ottoman alliance. This was sparked by an Albanian revolt against the Ottomans, which had begun in 1432. In 1435, Sigismund sent Fruzhin, a Bulgarian nobleman, to negotiate an alliance with the Albanians. He also sent Daud, a pretender to the Ottoman throne, in early 1436. However, following the defeat of the rebels in 1436, plans for an anti-Ottoman alliance ended. Sigismund died on 9 December 1437 at Znojmo (German: Znaim), Moravia (now Czech Republic), and as ordered in life, he was buried at Nagyvárad, Hungary (today Oradea, Romania), next to the tomb of the king Saint Ladislaus I of Hungary, who was the ideal of the perfect monarch, warrior and Christian for that time and was deeply venerated by Sigismund. By his second wife, Barbara of Celje, he left an only daughter, Elisabeth of Luxembourg, who was married to Albert V, duke of Austria (later German king as Albert II) whom Sigismund named as his successor. As he left no sons, his line of the House of Luxembourg became extinct on his death. Sigismund married twice but had little luck in securing the succession to his crowns. Each of his two marriages resulted in the birth of one child. His first-born child, probably a son, was born prematurely as a result of a horse riding accident suffered by Queen Mary of Hungary when she was well advanced in pregnancy. Mother and child both died shortly after the birth in the hills of Buda on 17 May 1395. This caused a deep succession crisis because Sigismund ruled over Hungary by right of his wife, and although he managed to keep his power, the crisis lasted until his second marriage to Barbara of Celje. Barbara's only child, born in the purple on 7 October 1409, probably in the castle of Visegrád, was Elisabeth of Luxembourg, the future queen consort of Hungary, Germany, and Bohemia. Queen Barbara was unable to give birth to any further issue. Elisabeth of Bohemia was thus the only surviving legitimate offspring of Sigismund. Coat of arms of John Hunyadi. Sigismund was known to speak fluent Hungarian, wore Hungarian-style royal clothes, and even grew his beard in the Hungarian fashion. He also spent huge amounts of money during his reign to rebuild the Gothic castles of Buda and Visegrád in the Kingdom of Hungary, ordering the transportation of materials from Austria and Bohemia. His many affairs with women led to the birth of several legends, as the one that existed decades later during the reign of the King Matthias Corvinus of Hungary. According to this, John Hunyadi was Sigismund's illegitimate son. Sigismund gave a ring to the boy's mother when he was born, but one day in the forest a raven stole it from her, and the ring was only recovered after the bird was hunted down. It is said that this incident inspired the coat of arms of the Hunyadis, and later also appeared in the coat of arms of Matthias "Corvinus". Sigismund adopted the Hungarian reverence for Saint Ladislaus I of Hungary, who was considered to be an ideal Christian knight at that time. He went on pilgrimage several times to his tomb in Nagyvárad. Before Sigismund died, he ordered to be buried next to the king saint. The Reformatio Sigismundi appeared in connection with efforts to reform the Holy Roman Empire during the reign of Emperor Sigismund (1410–1437). It was presented in 1439 at the Council of Basel, published by an anonymous author, and referred to the injustice of the German rulers. It included a vision of Sigismund's about the appearance of a priest-king, Frederick, as well as plans for a wide reform of the monarchy and emperorship and the German empire. Sigismund, by the grace of God elected Holy Roman Emperor, forever August, King in Germany, of Hungary, Bohemia, Italy, Dalmatia, Croatia, Rama, Serbia, Galicia, Lodomeria, Cumania and Bulgaria; Duke of Silesia and Luxembourg; Margrave of Moravia, Lusatia and Brandenburg. ^ "Sigismund - Holy Roman emperor". ^ Michaud, "The Kingdoms of Central Europe in the Fourteenth Century", p. 743. ^ Fine 1994, p. 501-502, 526-527. ^ Ćirković 2004, p. 89, 103. ^ Original Latin: Ego sum rex Romanus et super grammaticam Carlyle, Thomas (1858). History of Friedrich II of Prussia, Called Frederick the Great (Volume II). Gutenberg.org. ^ GRUNDY, T. R. (1872-12-28). "SIGISMUND "SUPER GRAMMATICAM"". Notes and Queries. s4-X (261). doi:10.1093/nq/s4-X.261.524-c. ISSN 0029-3970. ^ Wackernagel, Jacob; Langslow, David (2009-04-30). Jacob Wackernagel, Lectures on Syntax: With Special Reference to Greek, Latin, and Germanic. Oxford University Press. p. 456. ISBN 9780198153023. ^ Guenee, Bernard. Between Church and State: The Lives of Four French Prelates in the Late Middle Ages. ^ Bertényi Iván. (2000). A Tizennegyedik Század története. Budapest: Pannonica kiadó. ^ Hóman Bálint: Magyar középkor II. Attraktor, Gödöllő, Hungary, 2003. ^ Mályusz Elemér: Zsigmond király uralma Magyarországon 1387–1437, Gondolat, Budapest, 1984. ^ Dümmerth Dezső: A két Hunyadi. Panoráma, Budapest, 1985. ^ C. Tóth Norbert: Luxemburgi Zsigmond uralkodása 1387–1437. Magyarország története 6. Főszerk. : Romsics Ignác. Bp. : Kossuth Kiadó, 2009. ^ "1000 év törvényei". 1000ev.hu. Retrieved 2014-01-22. This article incorporates text from a publication now in the public domain: Chisholm, Hugh, ed. (1911). "Sigismund" . Encyclopædia Britannica (11th ed.). Cambridge University Press. Bak, János (1998). "Hungary: Crown and Estates". In Christopher Almand (ed.). New Cambridge Medieval History vol. VII. c. 1415–c. 1500. Cambridge: CUP. pp. 707–27. Baum, W. (1996). Císař Zikmund [Emperor Sigismund]. Prague. Ćirković, Sima (2004). The Serbs. Malden: Blackwell Publishing. Fine, John Van Antwerp Jr. (1994) . The Late Medieval Balkans: A Critical Survey from the Late Twelfth Century to the Ottoman Conquest. Ann Arbor, Michigan: University of Michigan Press. Hoensch, J. (1996). Kaiser Sigismund: Herrscher an der Schwelle zur Neuzeit, 1368–1437. Munich. Horváth, H. (1937). Zsigmond király és kora [King Sigismund and his age]. Budapest. Kéry, B. (1972). Kaiser Sigismund Ikonographie. Vienna and Munich. Mályusz, E. (1990). Kaiser Sigismond in Ungarn 1387–1437. Budapest. Mályusz, E. (1984). Zsigmond király uralma Magyarországon, 1387–1437 [King Sigismund’s reign in Hungary, 1387–1437]. Budapest. E. Marosi, ed. (1987). Művészet Zsigmond király korában, 1387–1437 [Art in the age of King Sigismund, 1387–1437]. 2 vols. Budapest: Hist. Mus. Michaud, Claude (2000). "The Kingdoms of Central Europe in the Fourteenth Century". In Michael Jones (ed.). New Cambridge Medieval History vol. VI. c. 1300–c. 1415. Cambridge: CUP. pp. 735–63. Mitsiou et alii, E. (2010). Sigismund of Luxemburg and the Orthodox World (Veröffentlichungen zur Byzanzforschung, 24). Wien. Mureşan, Dan Ioan (2010). "Une histoire de trois empereurs. Aspects des relations de Sigismond de Luxembourg avec Manuel II et Jean VIII Paléologue". In Ekaterini Mitsiou et alii (ed.). Sigismund of Luxemburg and the Orthodox World (Veröffentlichungen zur Byzanzforschung, 24). Wien: Verlag der Österreichischen Akademie der Wissenschaften. pp. 41–101. Takacs, I. (2006). Sigismundus rex et imperator: Kunst und Kultur zur Zeit Sigismunds von Luxemburg 1387–1437 [Sigismund, king and emperor: Art and culture in the age of Sigisumd of Luxembourg 1387–1437]. Mainz. "Sigismund" . New International Encyclopedia. 1905. Wenceslaus was, by inheritance, King of Bohemia from 1363 and by election, German King from 1376. He was the third Bohemian and fourth German monarch of the Luxembourg dynasty. Wenceslaus was deposed in 1400 as King of the Romans, but continued to rule as Bohemian king until his death. Ladislaus the Posthumous, known also as Ladislas, was Duke of Austria, and King of Hungary, Croatia and Bohemia. He was the posthumous son of Albert of Habsburg with Elizabeth of Luxembourg. Albert had bequeathed all his realms to his future son on his deathbed, but only the Estates of Austria accepted his last will. Fearing an Ottoman invasion, the majority of the Hungarian lords and prelates offered the crown to Vladislaus III of Poland. 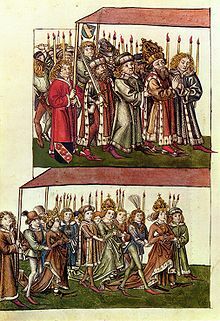 The Hussite noblemen and towns of Bohemia did not acknowledge the hereditary right of Albert's descendants to the throne, but also did not elect a new king. Wenceslaus III was King of Hungary between 1301 and 1305, and King of Bohemia and Poland from 1305. He was the son of Wenceslaus II, King of Bohemia, who was later also crowned king of Poland, and Judith of Habsburg. Still a child, Wenceslaus was betrothed to Elizabeth, the sole daughter of Andrew III of Hungary. After Andrew III's death in early 1301, the majority of the Hungarian lords and prelates elected Wenceslaus king, although Pope Boniface VIII supported another claimant, Charles Robert, a member of the royal house of the Kingdom of Naples. The Order of the Dragon was a monarchical chivalric order for selected nobility, founded in 1408 by Sigismund von Luxembourg who was King of Hungary at the time and later became Holy Roman Emperor. It was fashioned after the military orders of the Crusades, requiring its initiates to defend the cross and fight the enemies of Christianity, in particular the Ottoman Empire. The Counts of Celje or the Counts of Cilli were the most influential late medieval noble dynasty on the territory of present-day Slovenia. Risen as vassals of the Habsburg dukes of Styria, they ruled the County of Cilli as immediate counts (Reichsgrafen) from 1341 and rose to Princes of the Holy Roman Empire in 1436. Zawisza Czarny, Sulima coat of arms, was a Polish knight and nobleman who served as a commander and diplomat under Polish king Władysław II Jagiełło and Hungarian-Bohemian king Sigismund of Luxembourg. During his life, he was regarded as a model of knightly virtues and was renowned for winning multiple tournaments. His nickname is due to his black hair and his custom-made, black armor, which is kept at the Jasna Góra Monastery. Elizabeth of Luxembourg was queen consort of Germany, Hungary and Bohemia. The Přemyslid dynasty or House of Přemyslid was a Czech royal dynasty which reigned in the Duchy of Bohemia and later Kingdom of Bohemia and Margraviate of Moravia, as well as in parts of Poland, Hungary, and Austria. The House of Luxembourg was a late medieval European royal family, whose members between 1308 and 1437 ruled as King of the Romans and Holy Roman Emperors as well as Kings of Bohemia and Hungary. Their rule over the Holy Roman Empire was twice interrupted by the rival House of Wittelsbach. Elizabeth of Austria was the wife of King Casimir IV of Poland and thus Queen of Poland and Grand Duchess of Lithuania. Orphaned at an early age, she spent her childhood in the court of Holy Roman Emperor Frederick III. As one of the three surviving grandchildren of Emperor Sigismund, she had a strong claim to the kingdoms of Hungary and Bohemia. That made her an attractive bride for a Polish prince. The Polish nobility, seeking to increase Polish influence in Hungary and Bohemia, pursued marriage with Elizabeth since she was born and finally succeeded in 1454. Her marriage to Casimir was one of the most successful royal marriages in Poland. She gave birth to thirteen children, eleven of whom survived to adulthood. Four of her sons were crowned as kings. Ulrich II, or Ulrich of Celje, was the last Princely Count of Celje. Stibor of Stiboricz of Ostoja was an aristocrat of Polish origin in the Kingdom of Hungary. He was a close friend of King Sigismund of Hungary who appointed him to several offices during his reign. For instance, between 1395 and 1401, then from 1409 to 1414 he was the Voivode of Transylvania. Stibor styled himself "Lord of the whole Vág", referring to his properties along the 409-km-long river where 15 of his 31 castles were situated. The Margraviate of Moravia was one of the lands of the Bohemian Crown existing from 1182 to 1918. It was officially administrated by a margrave in cooperation with a provincial diet. It was variously a de facto independent state, and also subject to the Duchy, later the Kingdom of Bohemia. It comprised the region called Moravia within the modern Czech Republic. In the Late Middle Ages, the Kingdom of Hungary, a country in Central Europe, experienced a period of interregnum in the early 14th century. Royal power was restored under Charles I (1308–1342), a scion of the Capetian House of Anjou. Gold and silver mines opened in his reign produced about one third of the world's total production up until the 1490s. The kingdom reached the peak of its power under Louis the Great (1342–1382) who led military campaigns against Lithuania, southern Italy and other faraway territories. Ladislaus (I) Losonci was a Hungarian powerful baron, who served as Count of the Székelys from 1373 to 1376, and Voivode of Transylvania from 1376 to 1385 and from 1386 until his death. He was a staunch supporter of Mary, Queen of Hungary after 1382. In contemporary records, he was often called Ladislaus the Elder to distinguish him from his namesake relative Ladislaus II Losonci. Emeric (I) Bebek was a Hungarian powerful baron, who rose to prominence during the last regnal years of King Louis I of Hungary. After 1382, he was a staunch supporter of Mary, Queen of Hungary. Recognizing Sigismund's accession to the throne, he was made Judge royal, then Voivode of Transylvania. He received numerous land donations, which founded the wealth and influence of his family in the 15th century. Frank Szécsényi, also Francis, was a Hungarian powerful baron and military leader, who was a staunch supporter of King Sigismund of Luxembourg. He participated in various military campaigns against the Ottoman Empire. In 1401, he joined the magnate conspiracy against Sigismund, but returned to the king's allegiance shortly thereafter, retaining his political influence until his death. Simon Szécsényi, was a Hungarian powerful baron and military leader, who was a staunch supporter of King Sigismund of Luxembourg since the 1380s. Joining a magnate conspiracy of 1401, he played a key role in the arrest of the king, but later was pardoned and could retain his political influence until his death.